Starfleet’s worst thought-out undercover operation. We hope. With a war raging between the Federation and the Klingons, Sisko is assigned the task of exposing the Gowron Changeling, mentioned in “Broken Link”. Sisko takes Worf, O’Brien and Odo (who’s still smarting from becoming a human) and they masquerade as Klingons participating in a ceremony deep in the Empire after being transported there in Dukat’s Bird of Prey from “Return to Grace”. Just as Sisko’s about to use a new prototype device to determine that Gowron’s a Changeling, General Martok (J.G. Hertzler, seen in “The Way of the Warrior”) stops them. In a cell, Martok tells them he’s suspected that Gowron’s a Changeling and offers to help them kill him (the device has been destroyed). As Worf fights Gowron, Odo figures out that Martok’s actually the Changeling and exposes him. 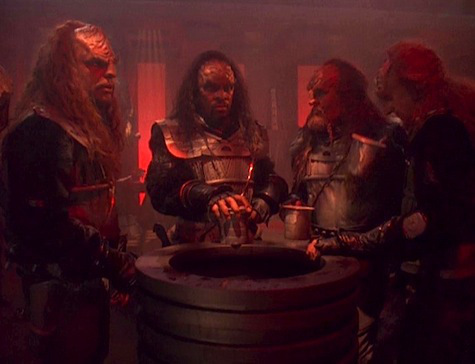 The Martok Changeling is killed and Gowron agrees to begin peace talks. 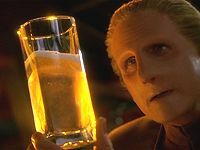 Odo, with some of his self-worth restored, goes back to his life on DS9. One of the most, ahem, “fortified installations in the Empire”. The beginning of the short war with the Klingons is significant, as is the end of that war (it drags on for a few more episodes, but the lead up to ending it starts here) as is the establishment of a relationship between Sisko and Gowron. That comes into play in a major way later in the season. Odo, again, plays a major role in interstellar matters. If he hadn’t exposed the Martok Changeling, Worf would have likely killed Gowron and the war would have continued — leaving the Alpha Quadrant ripe for conquest by the Dominion. This is a great time to bring up the issue of scope that we see in a lot of DS9’s final three seasons. Faithful readers, you’ll hear a lot from us on this topic, starting here. It’s really hard to believe that Starfleet would have sent Sisko, Worf, Odo and O’Brien on this mission. Even if you figure Sisko and Odo have a great deal of experience with Changelings — and Worf, of course, has a great deal of experience with Klingons — the four of them would have just been too recognizable. It’s actually laughable that they thought changing Worf’s hair would be even close to enough to make him look different. Beyond that, it’s kind of ridiculous how easy it was for Sisko and Co. to get into the Klingon installation. Wouldn’t there have been sensors to detect three human life signs in a ceremony where only Klingons were supposed to be in attendance? I know a big deal is made about Dukat’s efforts to get their names into the ceremony, but still. And, really, there’s the whole language thing (which I normally don’t bring up, but is key here) and the idea that Sisko and Co. talk so openly about their true identities with so many people in earshot. Klingons are known to be very paranoid — to the point where they’re described as “obsessive” about blood screenings. Frankly, this episode revolves too much around the gimmick of Sisko’s team dressing like Klingons. The best parts of it occur on Dukat’s Bird of Prey and in the prison cell with the Martok Changeling. It’s also somewhat disappointing that the war didn’t really end here. We see more Klingon stuff in “Nor the Battle to the Strong”, arguably DS9’s best use of Cirroc Lofton as Jake. On one hand, that’s DS9 doing its thing as the Trek series that best handled continuity. On the other, it makes the events in this episode a little less significant. Keiko’s back and she’s even more annoying than usual … because she’s possessed. Maybe that’s why she’s been so annoying for so long!